Photo from Eurofresh Evesham Ltd. I've decided that everyone who cooks should have fresh flat leaf parsley on hand at all times. It should be as readily available as skim milk and extra virgin olive oil. I have a flat leaf parsley plant but even indoors it has been growing slowly this winter because it is a bit cold in the mud room. So, I purchased a bunch of parsley for just .78 on Monday and have cooked with it every day this week. A pasta dish with peas, shrimp and a cream-based sauce. 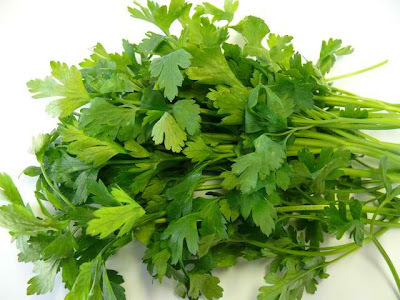 Parsley helps with any bloating that might come with eating a huge plate of pasta. Tuna salad with sweet corn and fat free mayo and dill pickles. It's also amazing with a dish I learned from a cooking show by French chef Jacques Pepin. (He does a fabulous show called "Fast Food My Way" that teaches you how to do French recipes without taking hours and hours.) He suggests trying this: rinse a can of butter beans, add lemon juice, minced garlic, salt, fresh cracked pepper and parsley. It is delicious and easy! Mmmm... Please come and cook for me!